Background: Setting of a cutting line based on an anatomical characteristic of the patient is essential for laparoscopic hepatectomy certain safely, but there is little navigation system and needs much time in detailed examination so far. Purpose: We examined the utility of the operation image support system using a new 3D volume analyzer (Synapse Vincent TM) based on an MDCT image. Result: We were able to depict an estimated excision volume and a hepatic vein return volume precisely for all cases in a short time. Consideration: Our new system is simple and easy, and can depict liver dissection and Grrison / the hepatic vein return volume. 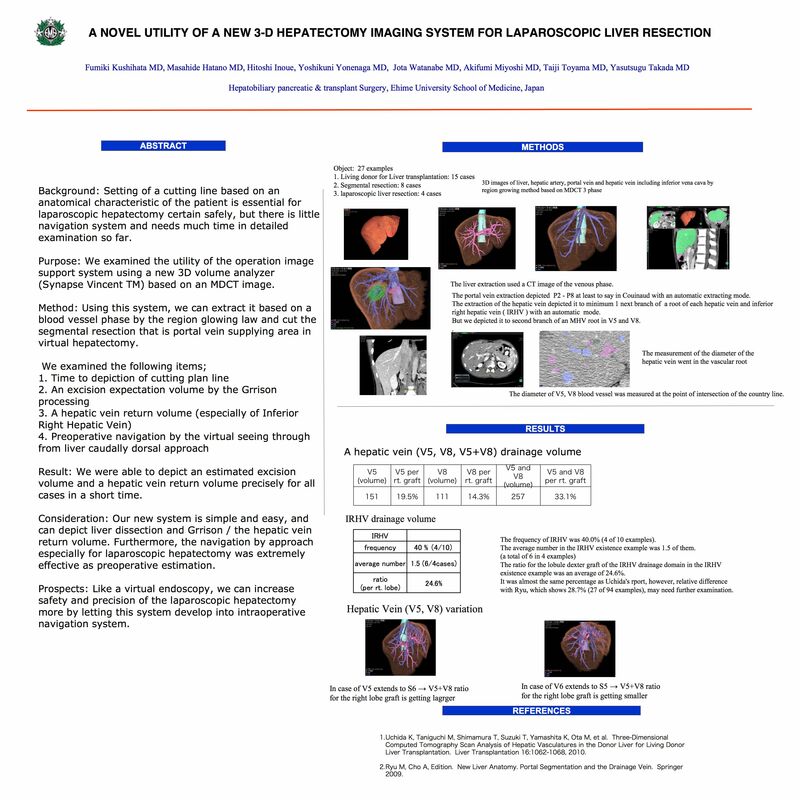 Furthermore, the navigation by approach especially for laparoscopic hepatectomy was extremely effective as preoperative estimation. Prospects: Like a virtual endoscopy, we can increase safety and precision of the laparoscopic hepatectomy more by letting this system develop into intraoperative navigation system.